Dundalk manager Stephen Kenny called on the government to treat the homeless crisis as a 'national emergency' as he collected the PFAI award for Manager of the Year last night. Kenny led Dundalk to a double this season, with the Lilywhites beating Cork City 2-1 in last weekend's FAI Cup final to add to their dominant league title triumph. 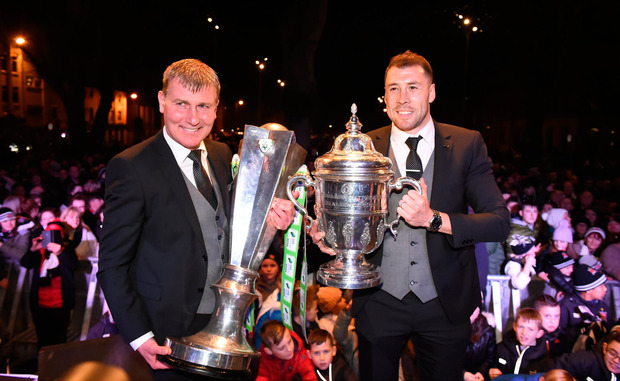 The Dundalk boss was honoured by the PFAI at last night's awards ceremony, but took the opportunity to address the homeless problem in Ireland during his acceptance speech. "It is becoming a much bigger issue," Kenny said. "Unfortunately [there's] more participants than ever. I think when you talk about real heroes in society, you talk about Fr [Peter] McVerry and the work that he does. He calls for the government to act like this is a national emergency. "It used to be people with addictions ,now it's normal families who can't afford their rent. I think it's a massive issue and the fact that it's not being treated as a national emergency as Fr McVerry suggested is a big disappointment." Kenny also praised the work done by volunteers in organising the Homeless Street League. "I think it was 17 years ago, Sean Cavanagh from the Big Issue contacted me about the Homeless Street Leagues and I think one of the things they've really done successfully over the years is the Homeless Street Leagues," he added. "Thomas Morgan is captain of the homeless team now in Mexico at the World Cup. I think the women's team were honoured in the Mansion House recently and the work that Sean Cavanagh and all the volunteers do in the leagues, I've just tremendous admiration for them. "There's a lot of great volunteers and their names are never mentioned, but they volunteer and they give up their time and they help people. The whole idea of the Homeless World Cup is that you can only represent Ireland for one year because you're hoping that's all it ever is."